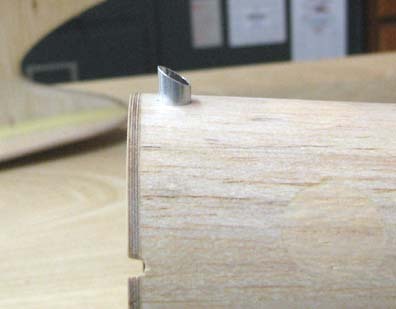 I'd suggest you consider making that drain hole at least 1/4". Otherwise gummy surface tension probably won't let it drain, unless you flush it through each flying session with alky or gasoline. You may also want to consider letting the tube project outside an eighth of an inch, so the runoff drips away instead of crawling back along the fuselage bottom when the ship is just sitting. Of course dripping could be messy itself. What Bob is talking about of course is the small aluminum lined 1/8" drain hole I installed in the bottom of the cowl as shown below. This morning I drilled out the 1/8" aluminum tube and enlarged the drain hole to 1/4" as shown below. 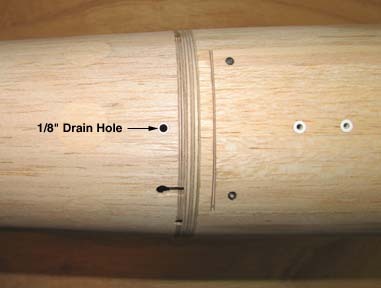 By the way, the CA had really bonded this tube well to the balsa. 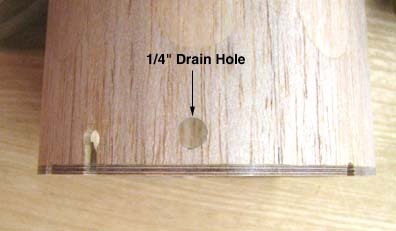 As per Bob's recommendation, I cut off a piece of the larger 1/4" aluminum tubing and slipped it in the drain hole as shown below. 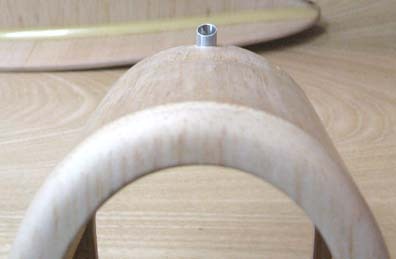 The end of the tube is flush inside the cowl and extends below the outside cowl surface, again responding to Bob's suggestion. You will also note that I cut the drain tube at a 45 degree angle on the bottom.